If you’re looking to understand a particular issue you can create a bespoke set of questions related to your objective and send it out to your customers via Rating Requests. Meanwhile, your Hively email snippet will still show the default rating page to customers if that’s what you would like. You can use a custom field set to differentiate between internal and external feedback – a simple drop down list (set as a required field) asking the rater to choose “Customer” or “Employee” is one way to do this. The results for this field can be analysed easily using the Reporting feature. If your company uses Net Promoter Score you could add a field to your rating page to collect this. Add a field asking the question “How likely are you to recommend (company name, product etc. )” with a drop down list with options of numbers zero to ten. You can add ‘hint’ text help explain the zero to ten scoring range. 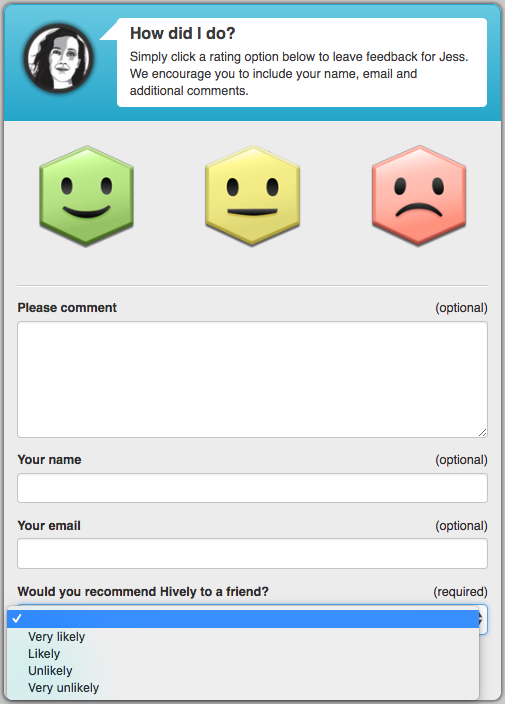 Raters will select one of the smiley icons giving you instant Hively feedback as well as a Net Promoter Score which gives you a different method to evaluate customer sentiment. The NPS scores can be collated and analysed via the Reporting feature. If you’re keen to try out this new feature you can find it in the main Hively drop down menu under “Fields”. This feature opens up many new possibilities and as a result it’s a little more complex to set up than many of our other features so I’d recommend a quick read of our support article to run you through the ins and outs of creating a new field set.